Web Cam vice president Laurie Dunlap has the perfect outlook and work ethic to keep her company atop the motorcycle industry in innovation and performance. “We are always looking for ways to improve and make more power,” Dunlap said. 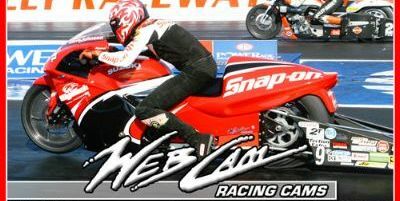 Web Cam was launched in 1945, and over the past several decades has become the undisputed, premier choice of motorcycle drag racers. These tremendously durable camshafts can be found hard at work, enhancing performance, above the valves of everything from a Kawasaki ZX-14 Street ET bike to the world’s quickest motorcycles. Web Cam supported Top Fuel legend Elmer Trett all the way up until his untimely death. It was through Trett, that Dunlap met legend-to-be, Larry “Spiderman” McBride, who would go on to dominate nitro racing and set multiple world records using Web Cams. Thanks in large part to excellent cams, McBride was the first dragbike racer to break into the five-second zone and currently holds the North American record at 5.74. 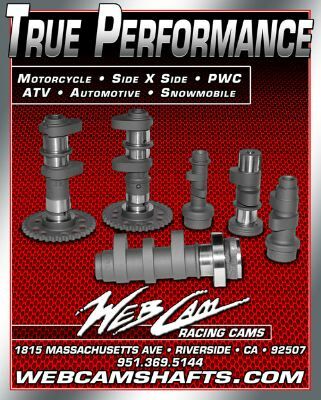 Web Cam’s product line and knowledge extends far beyond motorcycle drag racing. Web Cams are also available for ATVs, dirtbikes, vintage motorcycles, watercraft, snowmobiles and even many cars. Find out how Web Cams can upgrade your machine. Click here to shop Web Cam’s website.